Easy Instant Pot Boneless Beef Short Ribs. These tender, melt-in-your-mouth beef short ribs are served with noodle and can be ready in less than an hour. Cooking short ribs in an Instant Pot is a very convenient and quick method that requires 30 minutes cooking time in instant pot. The short ribs are meltingly tender when cooked in a one pot, especially with a rich flavor sauce. So if you are looking for an easy braised beef short ribs recipe that have all the flavor and no fuss, try this Instant Pot Boneless Beef Short Ribs. It’s not only delicious but will also save you hours of cooking time. 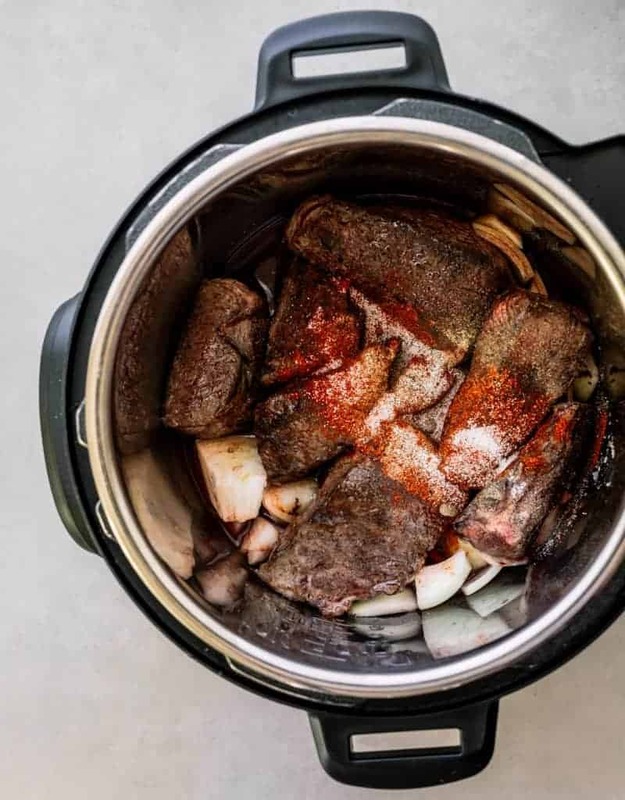 This Instant Pot Boneless Beef Short Ribs recipe is made of simple ingredients: boneless short ribs, onions, carrots, all purpose flour, thyme, paprika, tomato paste, beef broth, dry red wine, black pepper and salt . It’s so delicious, it can be eaten with pasta or mashed potatoes. It’s the perfect instant pot meal that not only adult will love but your kids will enjoy it too (mine sure did). To cook short ribs until tender it usually takes about 2 1/2 hours in the oven. With this instant pot, you only need to cook it for 30 minutes (plus 15 extra minutes for natural release) and additional 2 minutes to cook the vegetable (carrots). Short ribs have lots of meats on them and they are the most popular cut for BBQ and also taste good for stew. 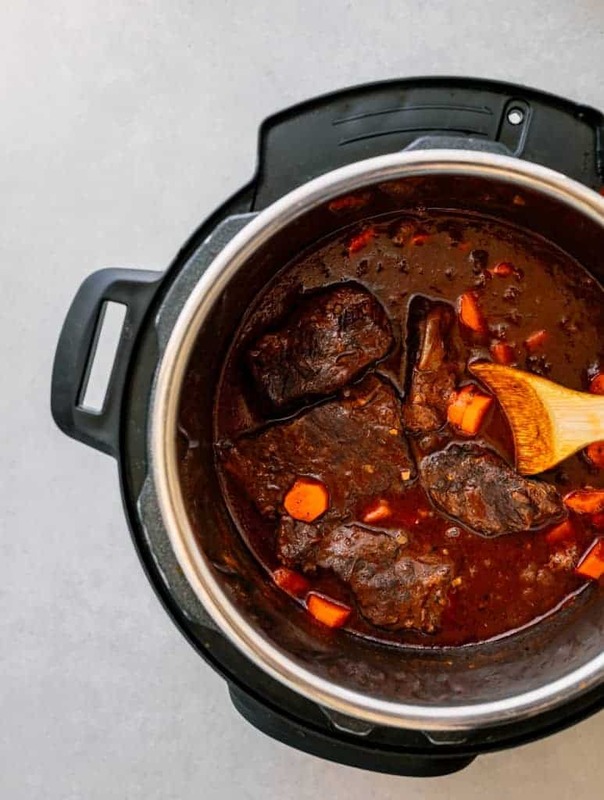 Boneless short ribs are cut from the chuck or plate, and consist of rib meat separated from the bone, which helps makes it perfect for this stew recipe: Instant Pot Boneless Beef Short Ribs. They are larger and meatier than pork spare ribs. As an alternative, chuck roast is the best substitute when boneless short ribs are unavailable. Are beef short ribs healthy? Beef short ribs are rich in protein, B12 but also high in fat. A 3-ounce portion of ribs contain about 210 calories, more than 30 grams of total fat and 13 grams of saturated fat. Consider your fat intake and for the day and week and balance accordingly to your health needs. 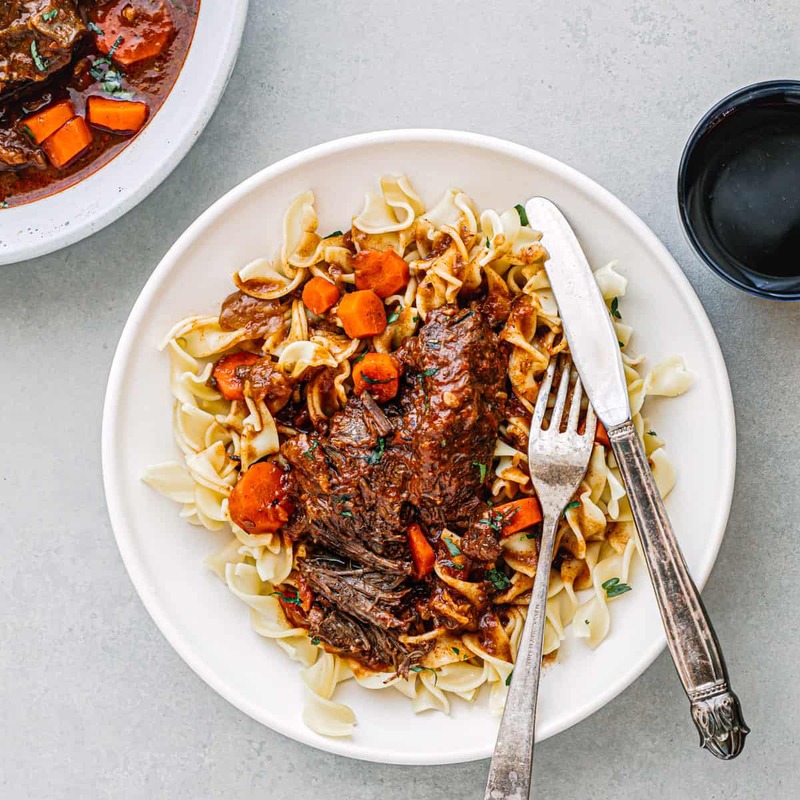 I served this instant pot short ribs with egg noodles. They taste perfect with polenta, or burger bun too. It’s also a great game-day food. If busy prepping for other things while hosting the braised short ribs can be a make-ahead meal. When properly stored, cooked beef ribs will last for 3 to 4 days in the refrigerator. For uncooked ribs, defrosted short ribs can be kept in the fridge for up to 5 days. Best red wine for stew: Cabernet Sauvignon, Merlot, Pinot Noir, Syrah, Zinfandel, Sangiovese, and Cabernet. A classic comfort food, beef stew, made with boneless beef short ribs and tasty sauce. Season boneless short ribs with 1 1/2 teaspoon salt . Turn on the instant pot and set to "Sauté" and adjust to more high heat. Add vegetable oil and heat until it shimmers. Working in batches, add boneless beef short ribs and cook for about 3 minutes on each side or until browned. Remove from instant pot and set aside. 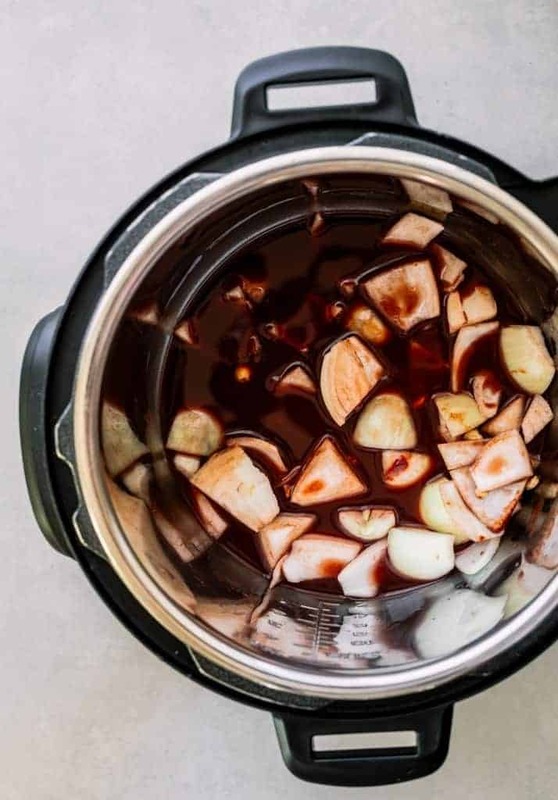 Add dry red wine to instant pot. Stir and scraping up any browned bits from the bottom of the instant pot. Bring the red wine to a boil and until it is reduced by 1/3 for about 1 minute. Add beef broth, garlic, onion, dried thyme, paprika, tomato paste, black pepper, salt and browned boneless beef short ribs to instant pot. Set the instant pot to "manual" and cook at high pressure for about 30 minutes. When cooking is complete, use a natural release to depressurize. Add chopped carrots to pot and cook at high pressure for 2 minutes. When cooking is complete, use a quick release to depressurize. To thicker the sauce, mix 2 tablespoons of water with 1 tablespoon flour. Set the instant pot to "sauté", add the flour mixture and let stew simmer until thickened. Adjust seasoning with salt and pepper if needed. Turn off the instant pot and sprinkle the stew with some fresh parsley. Serve immediately with egg noodle, polenta or on a bun. I absolutely love my instant pot! I am always welcoming to new recipe ideas so I can use it. I look forward to making this soon! So delicious! This recipe would be perfect to add to our upcoming menu plan. I know my family is going to love this. Yum. I love cooking things in my instant pot. This looks so good. I am going to have to look for short ribs at the store. I’ve had my Instant Pot about a year now. I can tell hubby is growing tired of the same ol’ recipes. The short ribs will be a nice surprise when he comes home for dinner tomorrow. Yum! My husband has been wanting more protein. With gluten free noodles I think he would love this. Thanks for the recipe!